Q: What did the mommy rope say to the baby rope? Explanation: When you tie a rope you make a knot. To behave badly is to be naughty (naw- tee); it is a word that is used with small children. 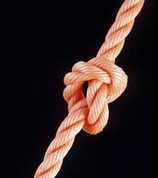 “Knotty” sounds like “naughty” and “naughty” is a word that a mommy might use with her child, like in the joke! Be good; don’t be naughty! This entry was posted in humor, Joke, jokes, jokes explained, kids jokes, reading, writing and tagged humor, joke, kids jokes, knot, mommy, naughty, reading, rope, writing. Bookmark the permalink.